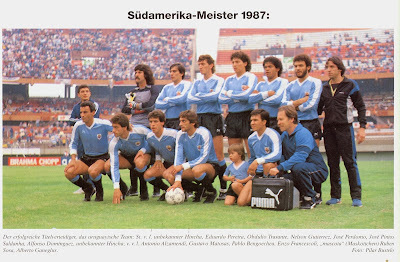 After decades during which the Copa America had been neglected to some degree, CONMEBOL members decided to organize the Copa America in a more professional and modern manner. The series had been staged under inconsistent intervals and on home and away series, which would take up to months. 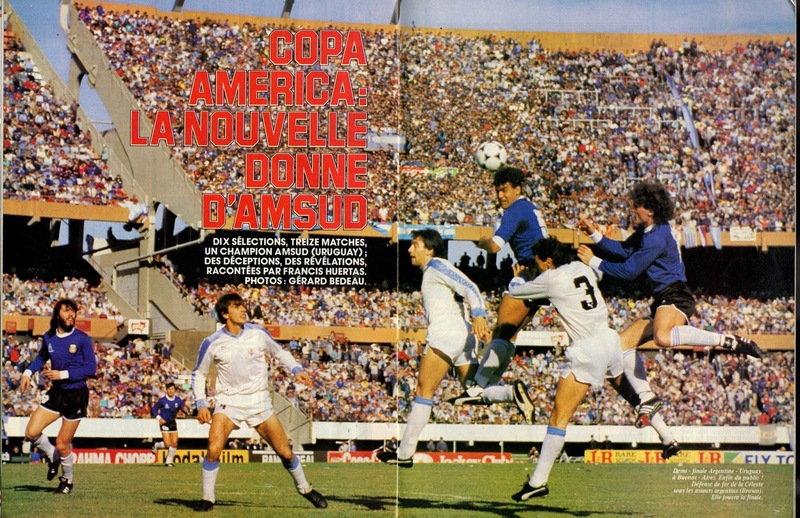 The 1987 Edition would mark the first Copa in decades that would be organized in one nation like a proper Tournament. 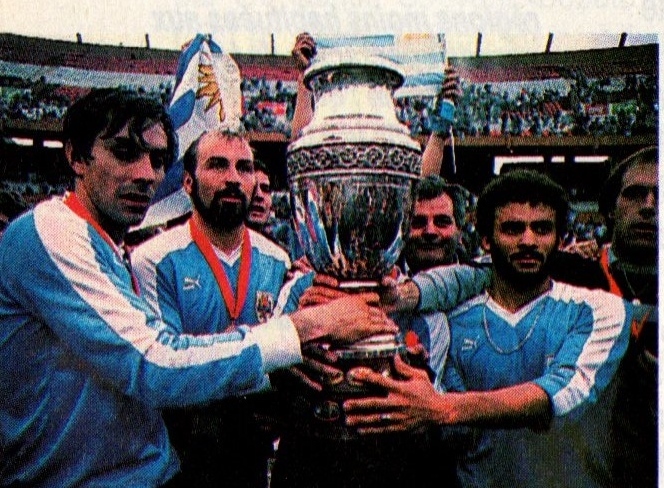 The recent World Cup Champions Argentina were selected to be the first host of the Copa America reboot. 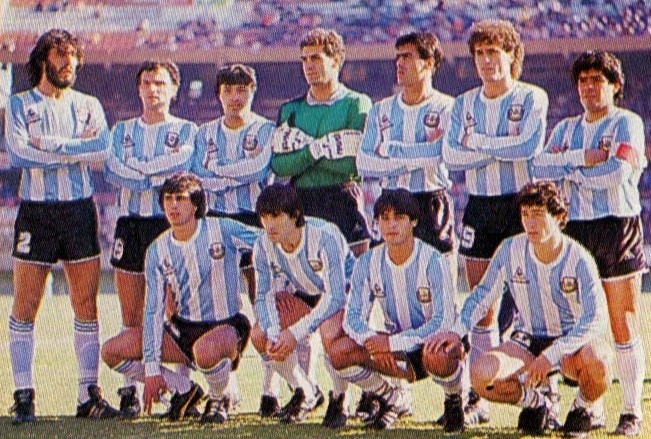 There was further attraction, as Carlos Bilardo’s squad would feature Diego Maradona, the undisputed number one player on the planet at the time. 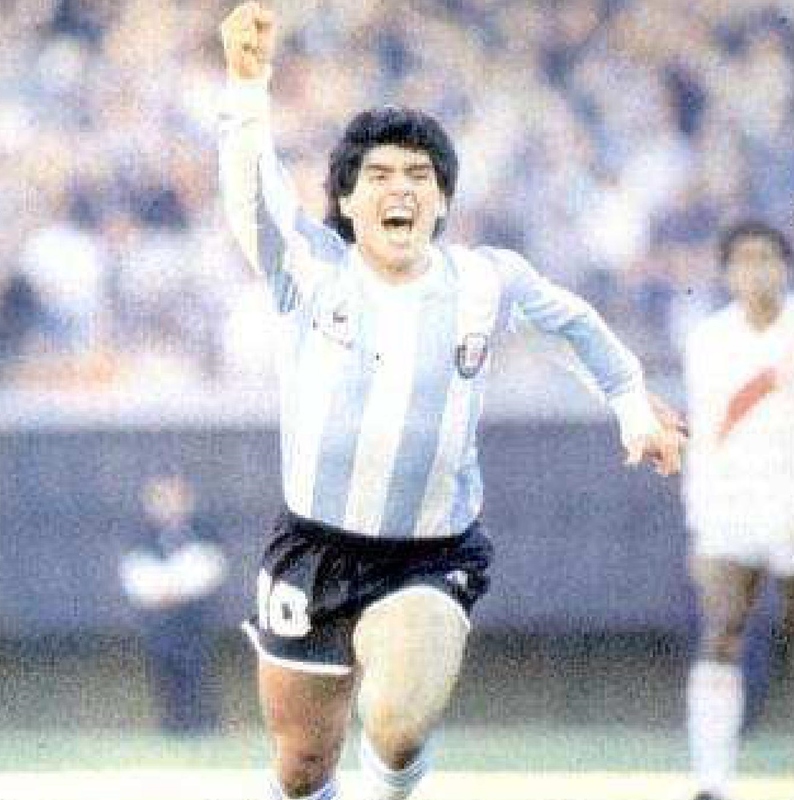 Following the World Cup win, the previous summer, he had just led Napoli to Serie A triumph. 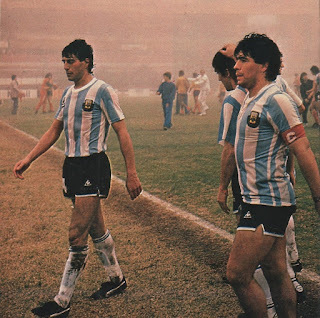 However, Argentina were not at full strength. 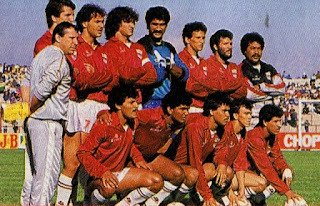 Starting goalkeeper Nery Pumpido, Jorge Valdano, Jorge Burruchaga and Hector Enrique were all unavailable due to various injuries. 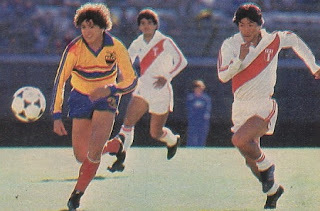 Pumpido had nearly lost his finger in a training accident with his club and required surgery, while Jorge Valdano was suffering from Hepatitis. In addition Bilardo could not call upon foreign-based players such as Claudio Borghi (AC Milan would not release him, as he was participating in the Mundialito of clubs). Lecce based Pedro Pasculli had wanted to participate and was even included in the Finals squad, but in the end his club would not release him (and Bilardo did not call up a replacement). 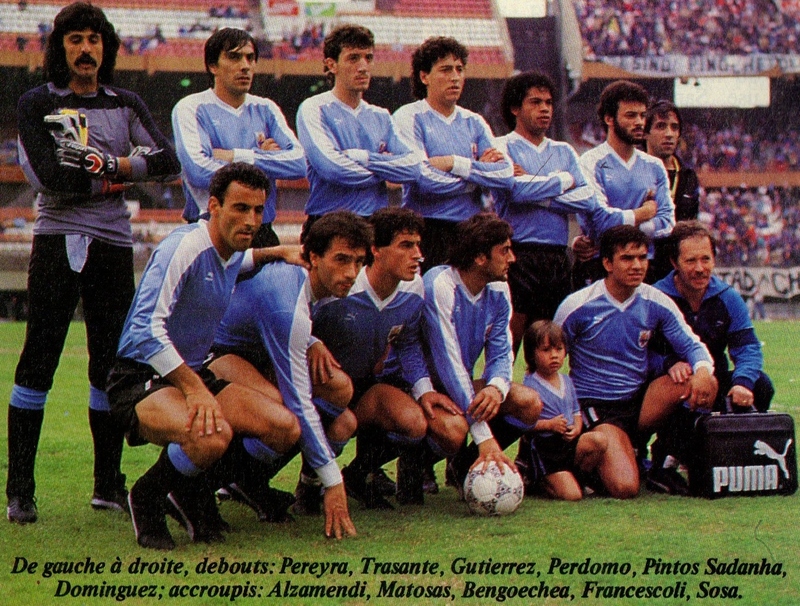 Bilardo had declared that he wanted to rejuvenate the base of his squad in preparations for the 1990 World Cup. He included youngsters such as Claudio Caniggia, Oscar Dertycia and Jose Percudani with that in mind. He played down expectations by saying that his squad would be only at 50 percent of their capabilities in the Tournament. He felt many of his players had been recently inured and/or had not played much (ex. 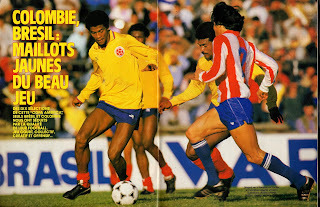 Julio Olarticoechea at Nantes), therefore he was not very optimistic of their chances. 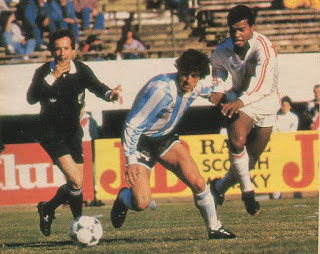 This Tournament would also feature the new-look Brazil under (not yet full-time) Manager Carlos Alberto Silva (who was also charged with the Olympics squad as well). Most veterans from Tele Santana’s era were gone, such as Zico, Socrates, Junior, Cerezo and Edinho. The youthful squad had just returned from a tour of Europe and left a positive impression. 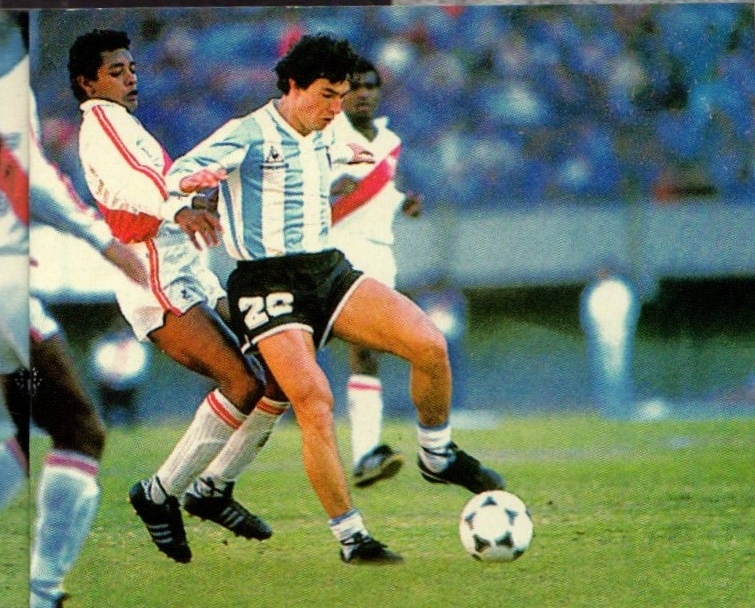 Many new players were introduced in the tour, such as Carlos Dunga, Romario, Rai (younger brother of Socrates) and Mirandhina (whose displays had earned a recent transfer to Newcastle United). There were few veterans left, goalkeeper Carlos, defenders Josimar and Julio Cesar, striker Antonio Careca and his young Sao Paulo teammate Luis Muller (who had featured in the previous year’s World Cup). 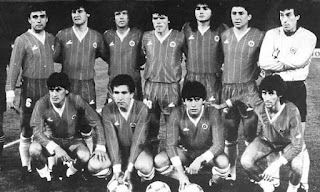 The only European based player was Julio Cesar, who played in the French League for Brest and was on his way to Montpellier. Incidentally Careca had just been signed by Napoli and would be teammates with Maradona for the years to come. The defending Copa America Champions Uruguay were trying to erase the negative memories of a disappointing World Cup, which included a humiliating (1-6) loss to Denmark. The new Manager Roberto Fleitas had not retained many of Omar Borras’ players. 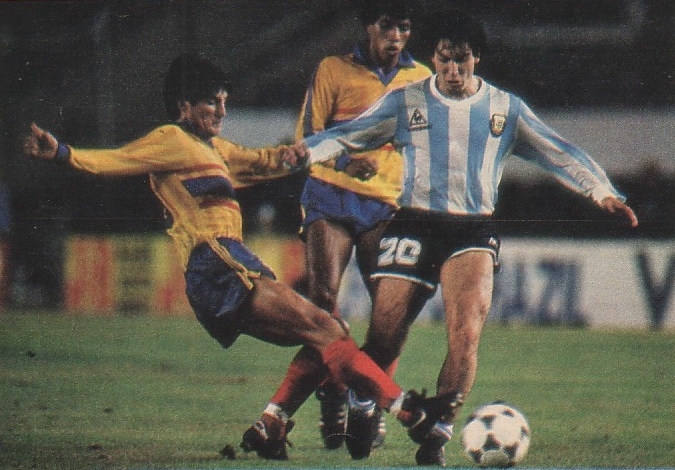 Enzo Francescolli, along with the likes of Nelson Guttierez and Antonio Alzamnedi were just a few of the veterans still in favor. The other squads were mostly unknown quantities, all trying to start new cycles as well. 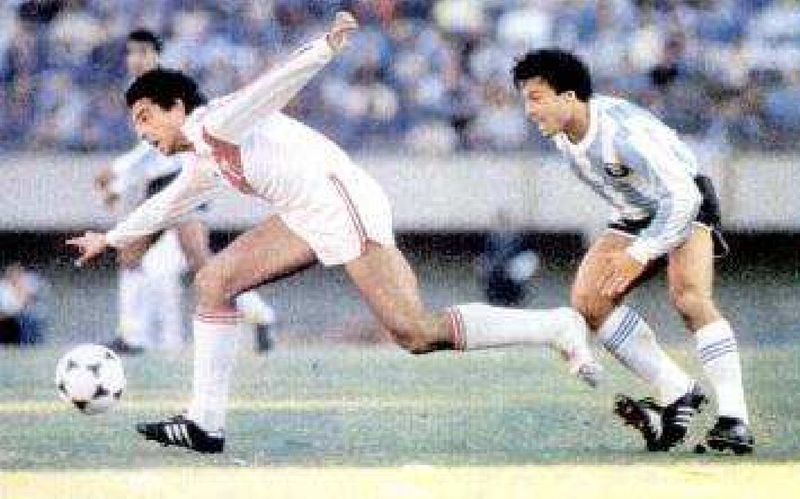 The hosts Argentina were paired in Group A along with Peru and Ecuador. 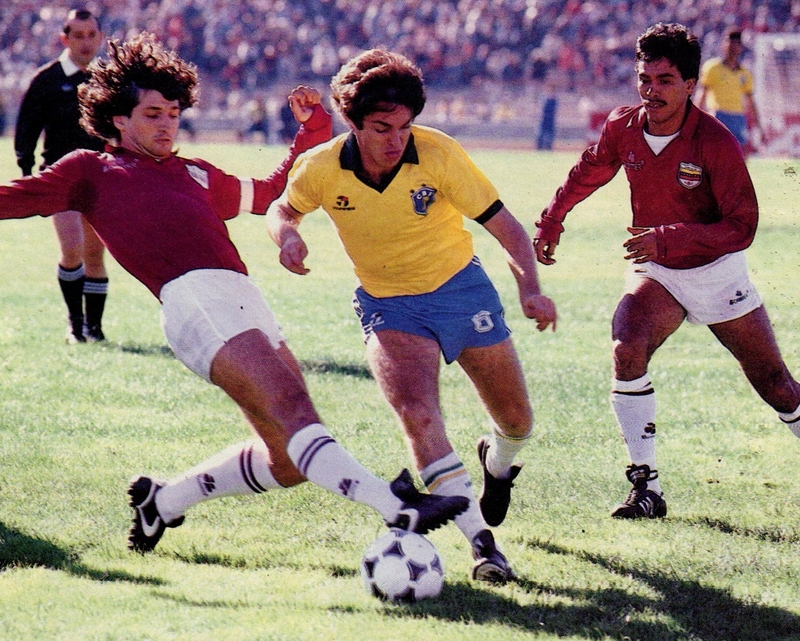 Brazil were in Group B paired with Chile and Venezuela, while Group C contained Paraguay, Colombia and Bolivia. 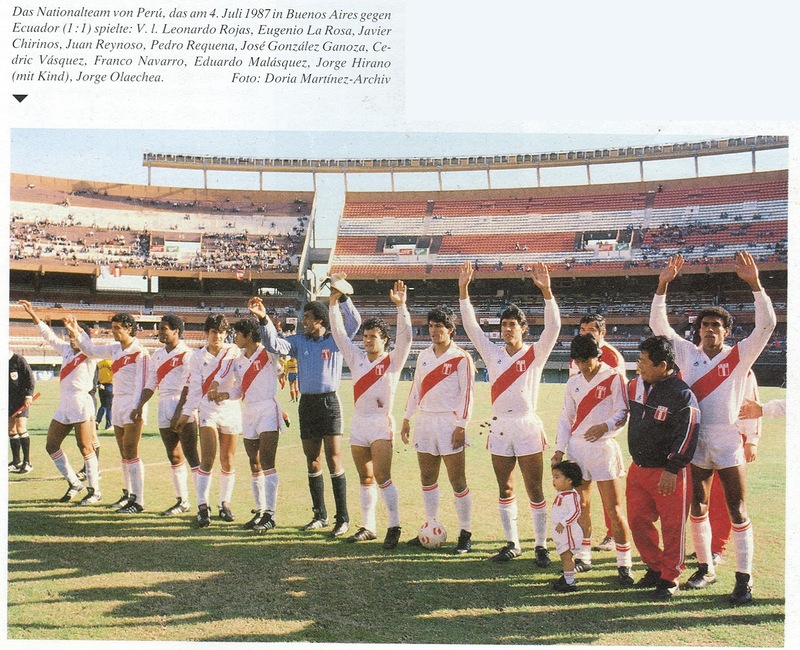 The Tournament kicked off on June 27th at River Plate’s El Monumental Stadium with the hosts taking on Peru. 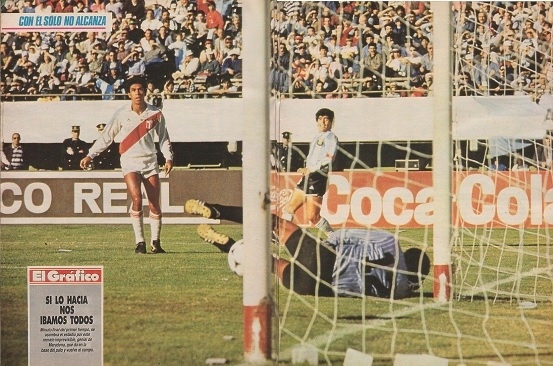 The pre-match talking point about this match had been the World Cup Qualifiers on June 1985 between the two squads, where Peru’s Luis Reyna had subjected Maradona to a very brutal man-marking. For his part Reyna insisted that he was only following the instructions of his Manager. 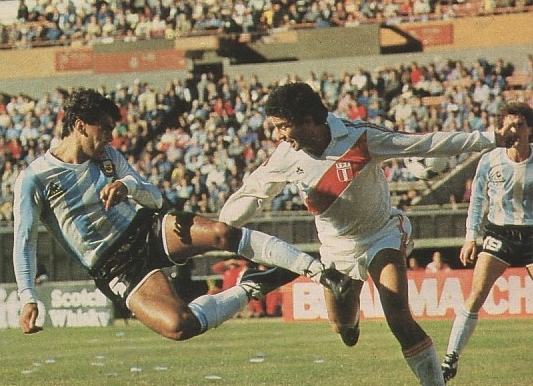 In any event this opening match turned out to be a physical affair with no rhythm and no significant action. 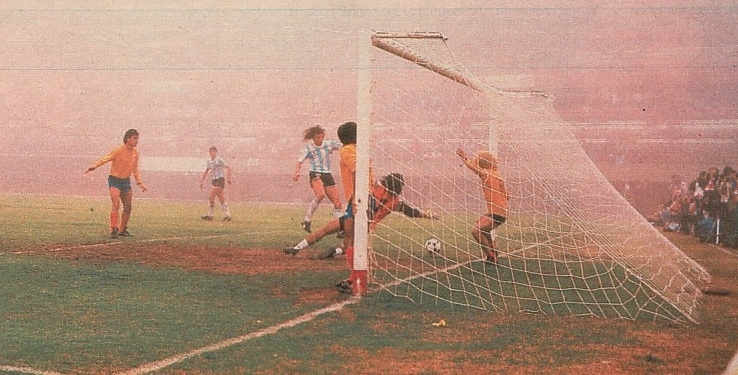 Argentina did have more of the chances and should have won but settled for a tie. 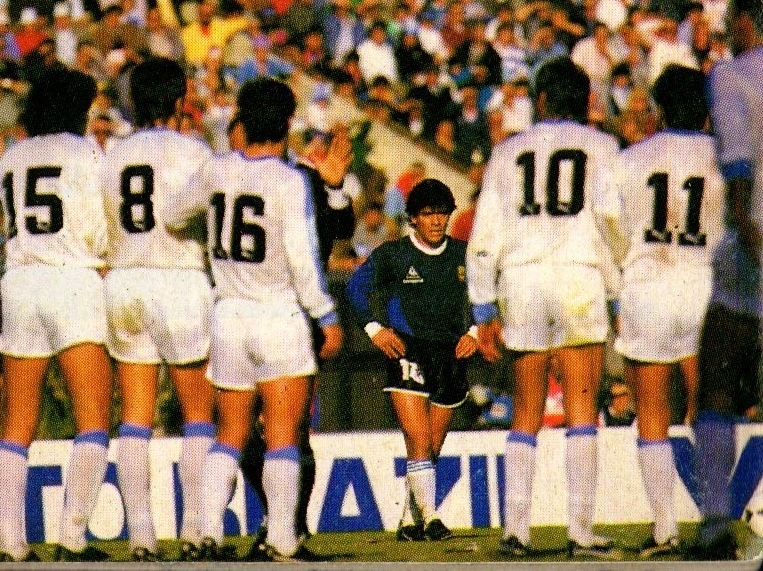 The goalscorers turned out to be Maradona and surprisingly Reyna. 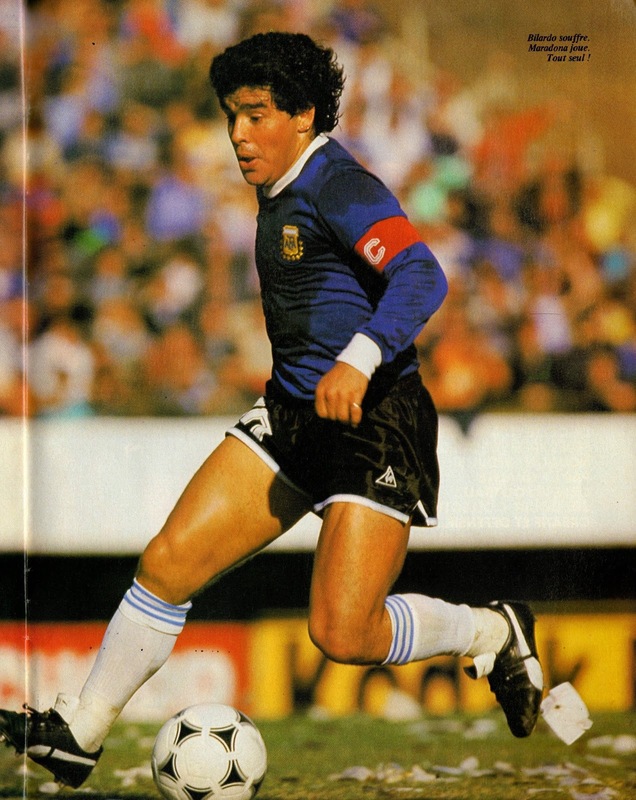 Maradona shot Argentina ahead just after the start of the second half when he controlled a cross in the box and slotted it past Ganoza. In the 59th minute, Reyna headed the equalizer from a corner from the left. Afterwards Reyna said that this was the best day of his life that he would always remember. According to him, it vindicated him against the critics and proved that he was not just a watchdog. 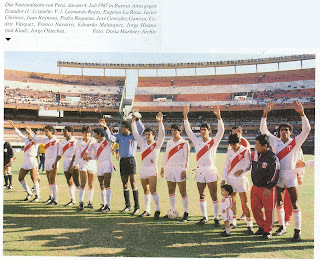 Reyna unluckily would miss Peru’s next match vs. Ecuador on July 4th after an injury during training. He fell down on an uneven ground in a park and injured his heel. Before that on July 2nd, Argentina took on Ecuador. 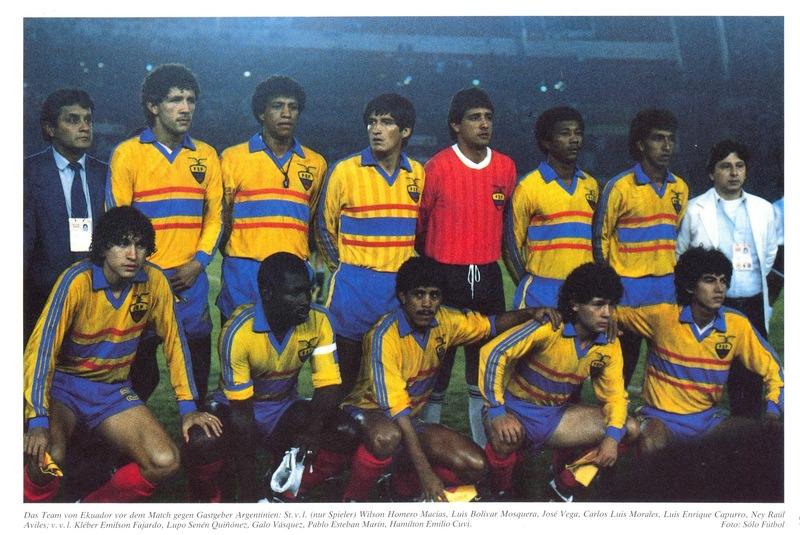 An interesting aspect of Ecuador’s selections was that a maximum of three players were selected per club since League play was still ongoing and this was an attempt not to weaken any specific team. 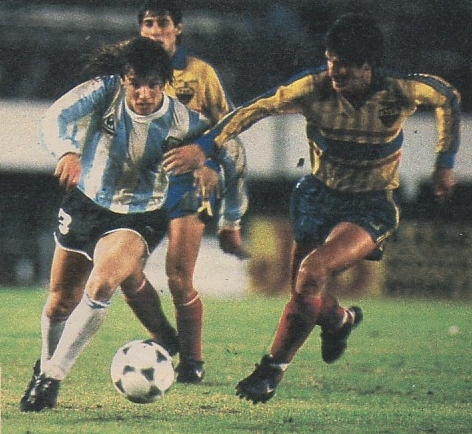 In this match, the home side broke the deadlock in the second half after the introduction of Caniggia. 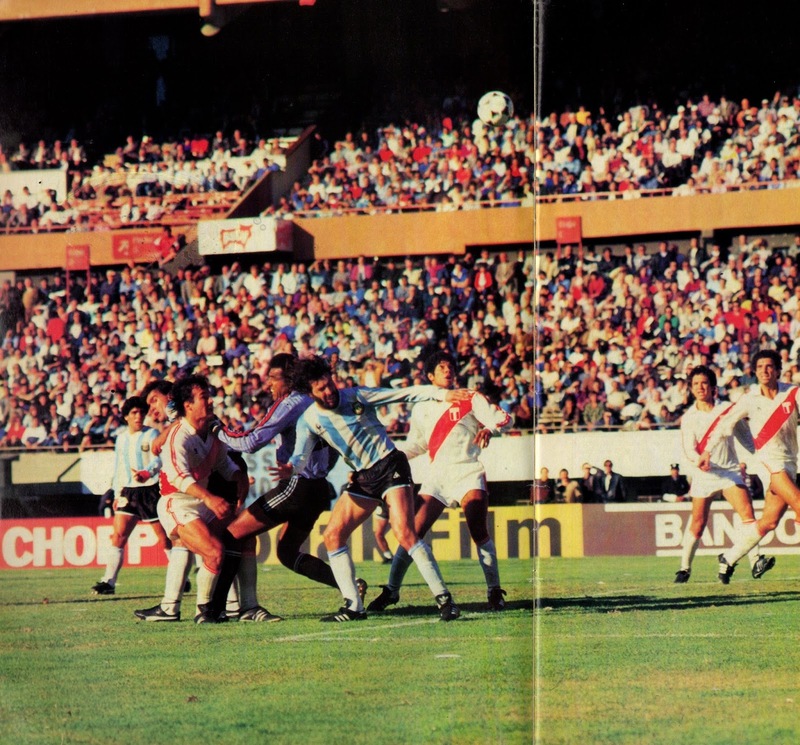 In the 50th minute, after a move that was started by Maradona, Caniggia scored with a downward header from across from the right side. Mardona doubled the lead in the 67th minute with a penalty kick. 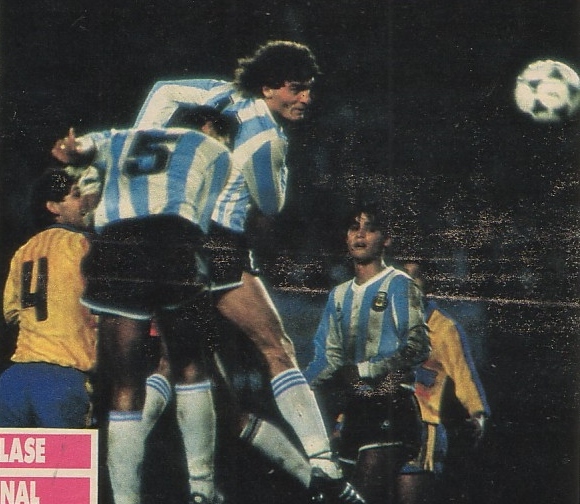 He scored Argentina’s third with five minutes remaining with a curling free kick. Two days later, matches were wrapped up in Group A as Peru and Ecuador cancelled one another in a (1-1) tie and Argentina advanced to the semifinals. Group B started the day after Argentina’s opener on June 28th at Córdoba with Brazil taking on Venezuela. 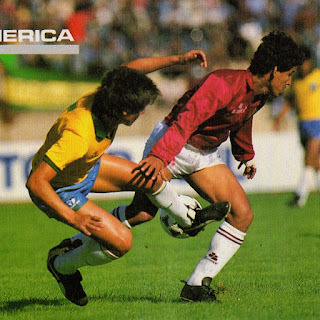 In a one-sided encounter Brazil easily defeated South America’s weakest side (5-0). 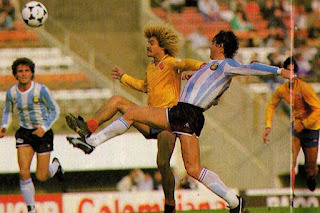 Edú Marangón shot ahead Brazil in the 33rd minute after picking up a deflection from the Venezuelan defense from a Ricardo Rocha cross. Six minutes later Zdenko Morovic deflected Nelsinho’s cross from the left side. 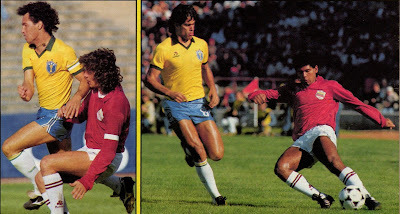 In the 66th minute, Rai released Muller on the right side, whose cross into the box was met by Captain Careca. 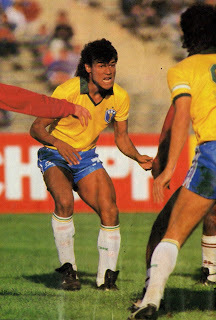 A few minutes later, Nelsinho picked up and scored from a rebound from Romario’s header, who himself scored Brazil’s fifth just before the final whistle. The next match in the Group took place two days later with Chile taking on Venezuela. The Chile win (3-1) was a formality; the main talking point had been Chile’s players’ threat to walk out over a row over bonuses with their Federation. In the end a compromise was reached and Chile concentrated on the matters on the field. 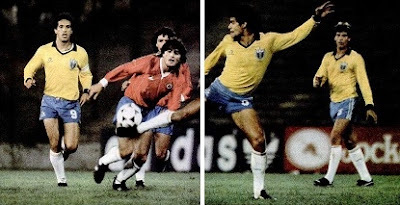 This set the stage for the deciding match in the Group on July 3rd between Brazil and Chile. 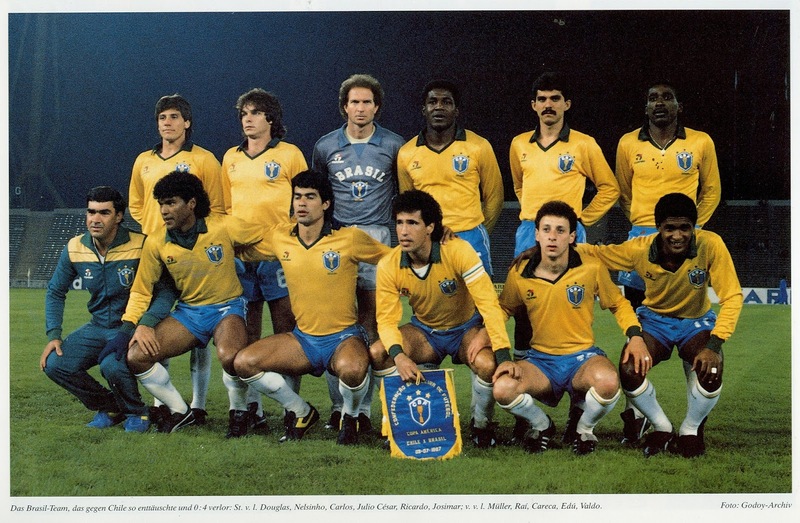 Brazil had been favored because of their history and a number of good displays in the new year. However, this match turned out to be a nightmare for Brazil as they suffered one of their most humiliating defeats in competitive Football. Brazil’s main change from the Venezuela match had been the inclusion of defender Julio Cesar at the expense of Geraldao. Julio Cesar had complained after his omission in the first match that if Brazil Management had not intended for him to start, they should not have selected him for a trans-continental journey. Chile tore apart Brazil using an efficient counter-attacking tactic. 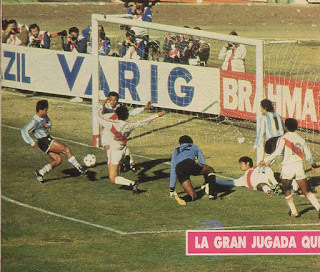 They broke the deadlock just before halftime, when Ivo Basay headed Contreras’ free kick in. Brazil started the second half with a goal down and extra pressure. Just a couple of minutes into the second half, Chile goalkeeper Rojas took a goal kick that went untouched by the Brazilian defense. 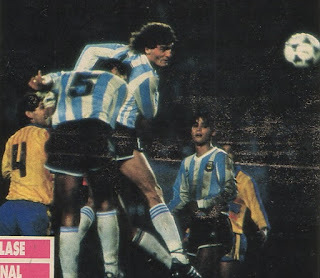 It reached Letellier who lobbed it over Carlos. Brazil were further unlucky as both Rai and Careca hit the post. Things took a turn for the worst for Brazil in the 57th minute when Nelsinho was sent off after Brazil had already made both of its substitutions. In the 68th minute, Contreras took a corner from the right side that was headed it in by Basay. In the 75th minute, Chile scored its fourth against a demoralized and disorganized Brazil. Letellier scored after a combination play with Astengo. Chile advanced to the semifinals, while Brazil were left wondering what went wrong and who to blame. 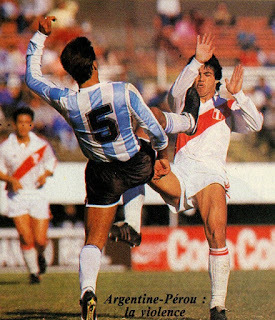 Group C matches took place at Rosario and kicked off on June 28th with a dismal scoreless tie between Paraguay and Bolivia. Afterwards Paraguay Manager Silvio Parodi took his squad back to Paraguay (to return before the match vs. Colombia). He took the decision since he did not like the climate in Rosario. As far as Bolivia, it is worth mentioning that two of its players: Salvia and Ramos were sent home after leaving the team premises without authorization. Of course this was the Tournament that introduced Pacho Maturana’s glorious Colombia generation led by Carlos Valderrama. 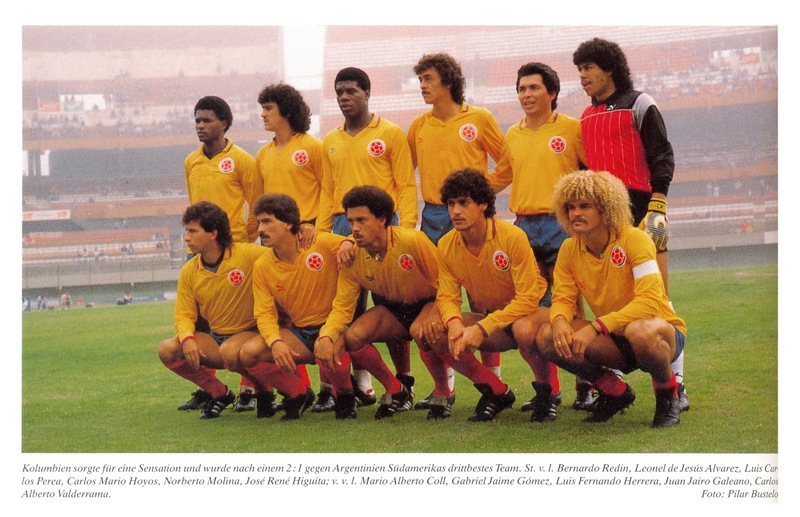 For their first match on July 1st, they defeated Bolivia (2-0) with goals by Valderrama and Arnold Iguaran. 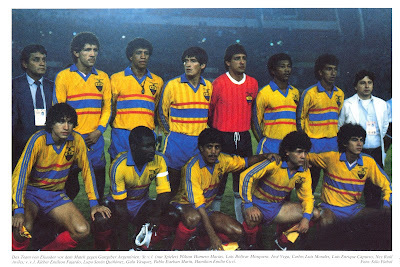 A few days later on July 5th, they impressed even more with their (3-0) defeat of Paraguay through a hat trick by Iguaran, who ended as the top goalscorer of the Tournament with his fourth goal to advance Colombia to the semifinals. 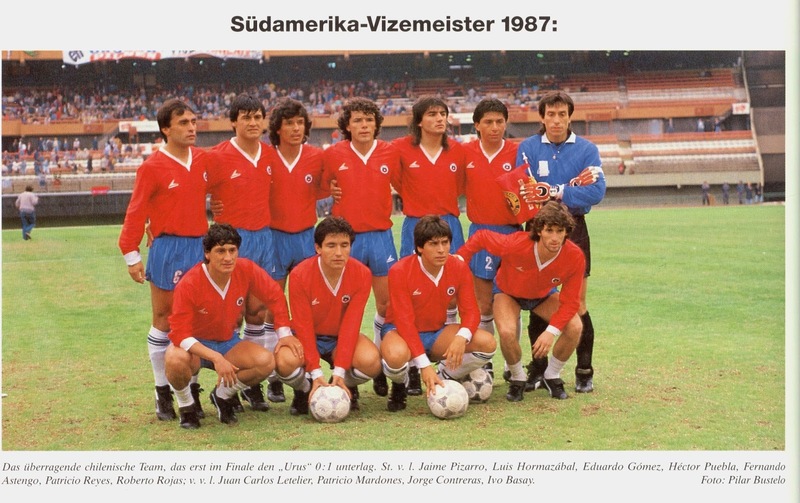 The first semifinal took place on July 8th at Córdoba between Chile and Colombia. 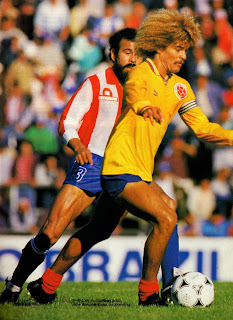 It was a hard fought match that Colombia actually dominated for long spells but the Chilean defense was in fine form. 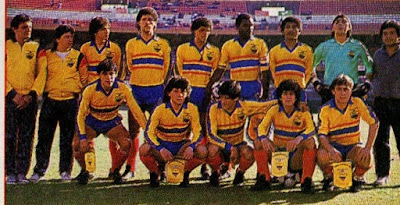 The match went into extra time and Colombia took the lead in the 103rd minute through a penalty kick by Bernardo Redín. However, in a matter of five minutes Chile overturned the deficit. Astengo scored the equalizer after a heading in a corner from the right taken by Contreras. 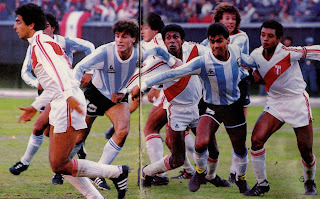 Astengo was fortunate that Higuita had mistimed his jump on the corner. 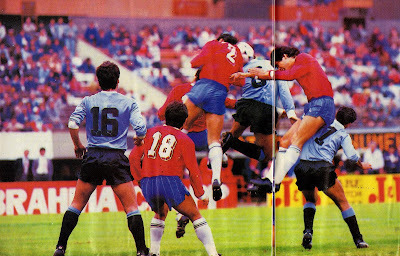 Just minutes later, a shot by Salgado was stopped on the line and Jaime Vera picked up the rebound to score Chile’s winner. 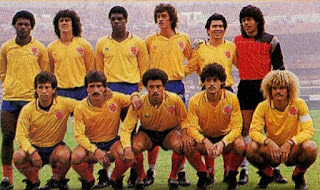 Given the flow of the match, the result seemed unfair to Colombia. On the following day, Argentina took on Uruguay at ‘El Monumental’. This was Uruguay’s debut in the Tournament. 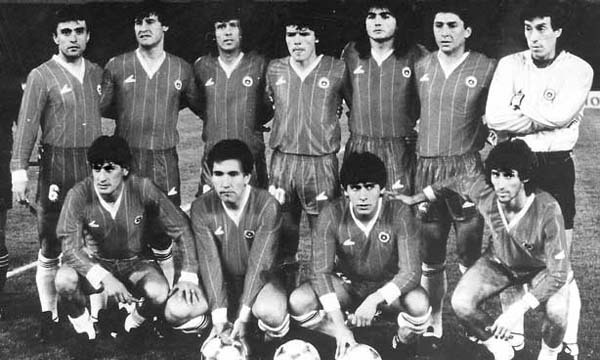 As defending Champions, they had received a bye for the First Round (The last time such a policy would be used). 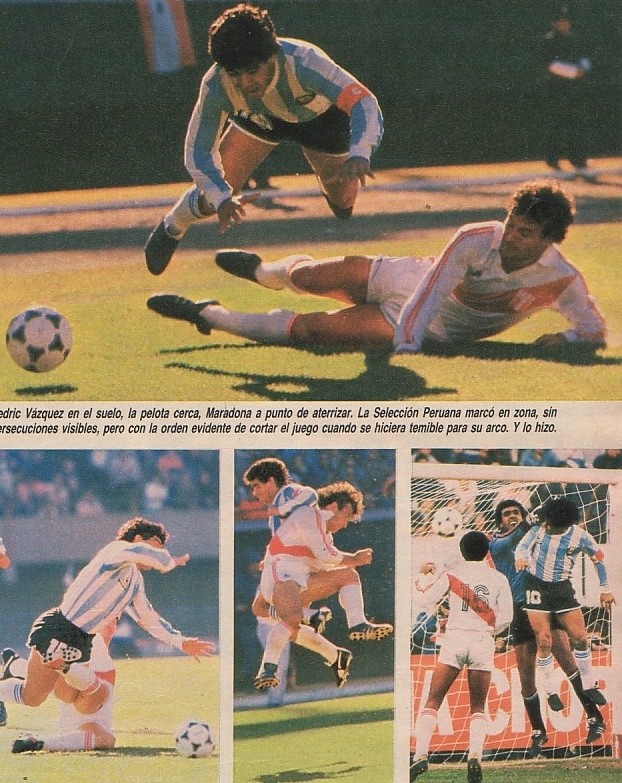 Argentina dominated for the most part but could not score. Maradona played despite having missed two days of training (because of sore throat). 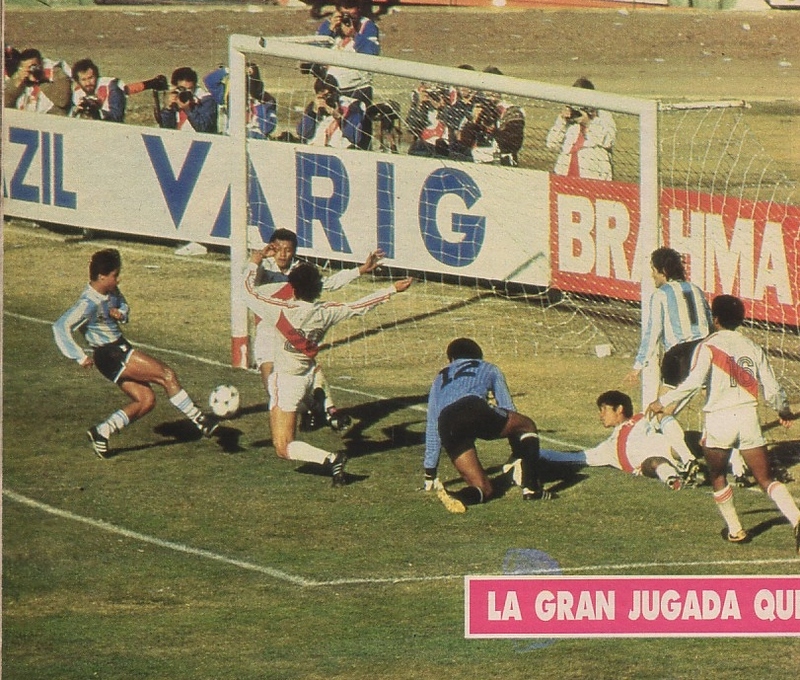 Just before halftime, Uruguay took the lead. Ruben Sosa delivered a pass to Francescolli, who in turn gave it to Alzamendi who shot and scored from the edge of the box. Afterwards Uruguay just sat on defense and held the score to advance to the Final. They were some fighting between the fans in the stands and more than 30 arrests were made. 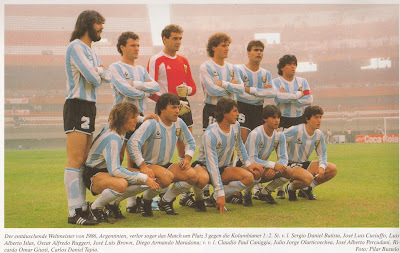 Two days later a disappointed Argentina took on the surprising Colombians for the Third place match. In a virtually empty stadium, Colombia took a two-goal lead in the first half. 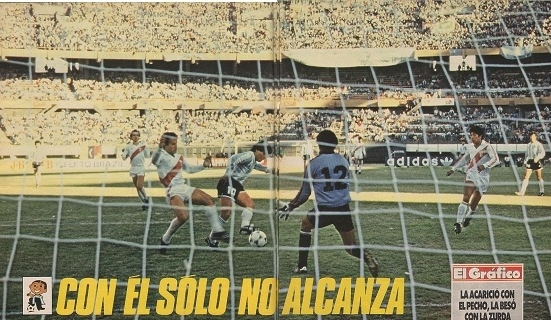 In the 8th minute, Gabriel Jaime Gómez scored from a long shot from outside of the box. 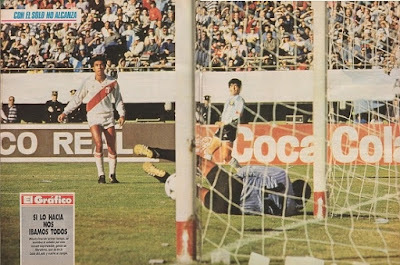 In the 27th minute, Valderrama lobbed a pass to Galeano to score. The second half was virtually un-watchable due to the heavy fog. Just before the end. 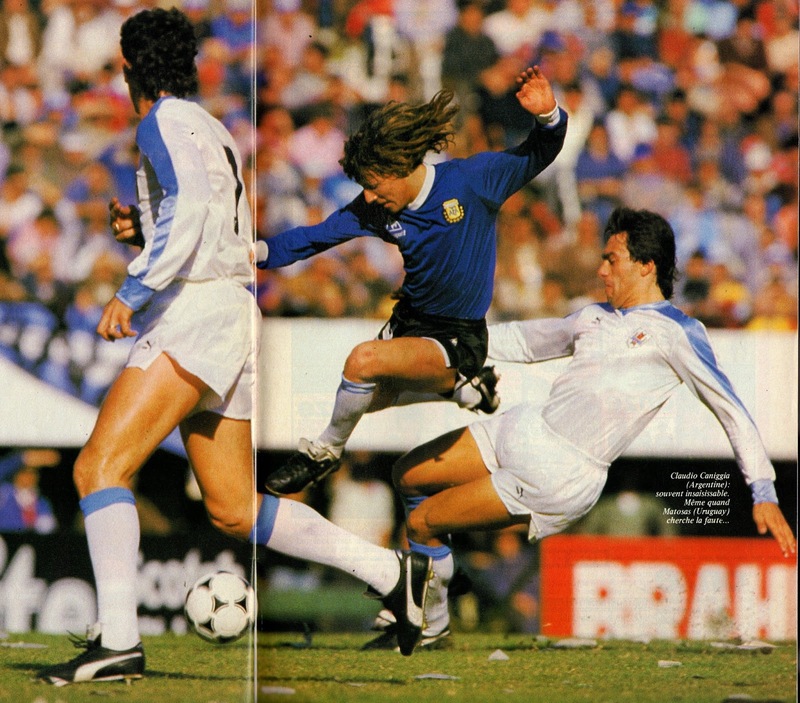 Caniggia salvaged some pride for the home side by pulling a goal back. 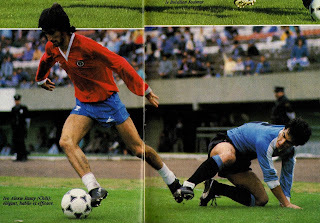 The following day on July 12th, Uruguay and Chile faced off for the Final. It turned out to be a physical and violent match. 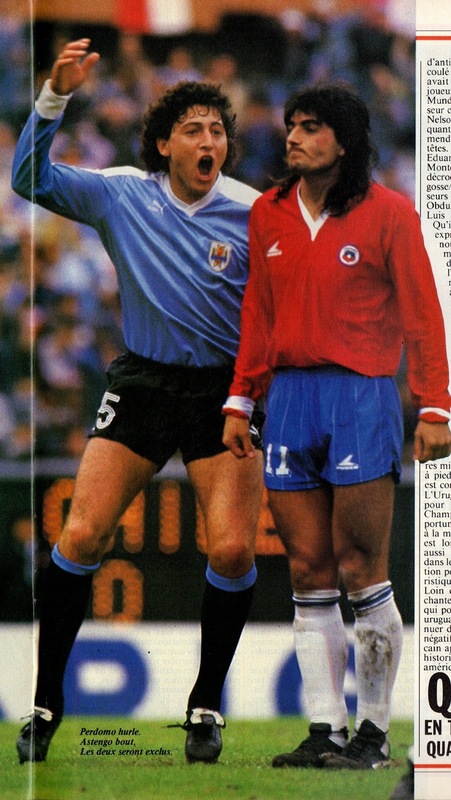 Chile’s Eduardo Hernán Gómez was sent off in the 14th minute for a foul on Francescolli. 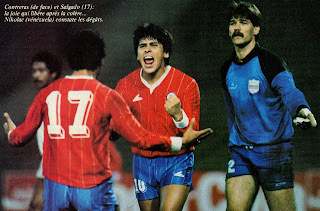 Francescolli was himself sent off in the 27th minute after an altercation with Toro. Francescolli retaliated after having suffered the brunt of Chile’s fouls uop to that point. 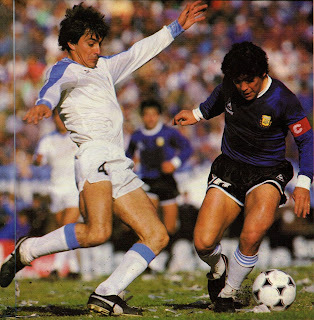 Francescolli was the only techincal player in Uruguay’s side and with him gone, Uruguay was left with just brute physical force. Chile sonewhat improved in the second half, but it was Uruguay who scored the winner. 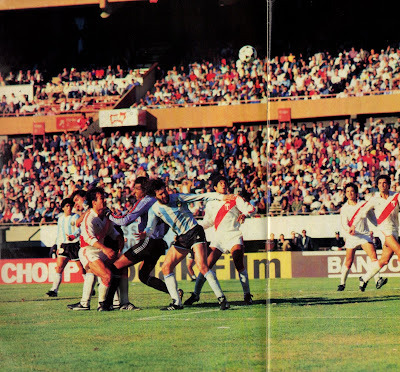 In the 56th minute, Ruben Sosa took a corner from the right side that was headed back to the edge of the box by the Chilean defense. 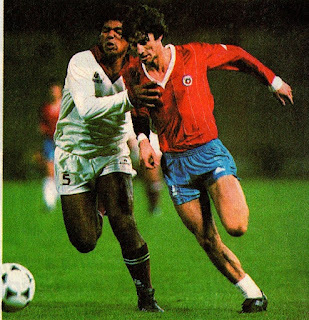 Jose Perdomo volleyed the loose ball that the Chilean goalkeeper Rojas parried. 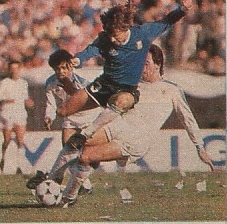 Pablo Bengoechea picked up the rebound and scored Uruguay’s winner. Near the end , both Jose Perdomo and Fernando Astengo were sent off as well to end the match on an even more sour note. The sent off Perdomo (Uruguay’s Captain) actually came back and lifted the Trophy at the end. Overall it had been a disappointing Tournament with criticisms on the organization as well as the action on the field. The lack of attendance was a major problem and the organizers had hoped better. 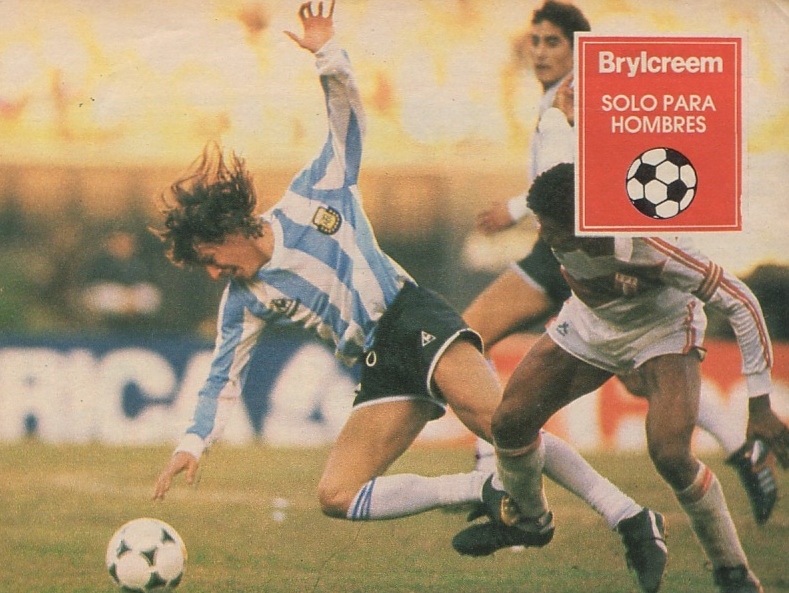 Besides matches that involved Argentina, most stadiums were barren. Discipline on the field was also a cause for concern; there were 33 bookings as well as an astonishing number of sending offs (14 in total, with 4 in the Final itself). There were also complaints about Training locations. Peru left their base of ‘Hotel Intercontinentale’ in Buenos Aires after two days because of the subway noise. They also trained in sub-standard locations, such as a public park (a reason why Luis Reyna was injured). The Home Nation Argentina were disappointing in their displays despite the presence of Maradona. 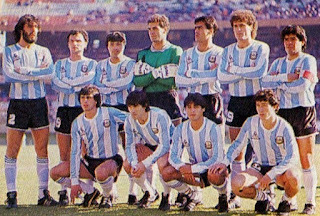 They played like an average side dependent upon Maradona. 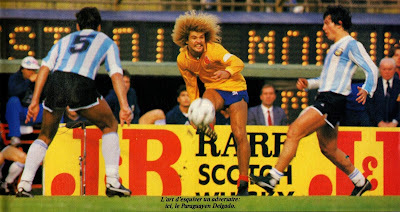 Claudio Caniggia did make an impression on observers and his displays surely helped him to earn a transfer to Italy (Verona) the following year (1988). Colombia were the surprise of the Tournament and Journalists named Carlos Valderrama as the player of the Tournament (Chile goalkeeper Rojas finished second). It was the starting point of Pacho Maturana’s ‘El Toque’ one touch play that qualified for the World Cups of 1990 and 1994. 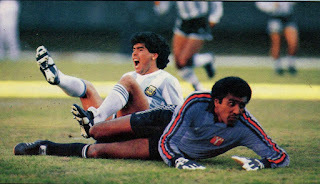 Apart Valderrama, the continent observed the likes of Redin, Iguaran, De Avila and sweeper-goalkeeper Rene Higuita. 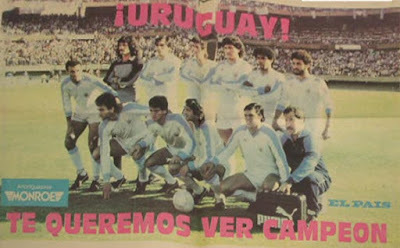 The Champions Uruguay in both of their matches resorted to the physical tactics that had turned off most critics during the 1986 World Cup. There was no artistry nor imagination in their game (Francescolli excepted). Critics, Journalists, Fans and former players tried their best to explain Brazil’s inexplicable implosion vs. Chile. According to the Press, the relationship between the players and the Management had deteriorated due to problems related to bonuses. There were also reports that the team had not liked how defender Geraldao had been replaced in the starting lineup vs. Chile to accommodate Julio Cesar. 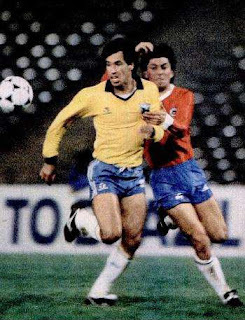 In the match itself, Geraldao later came on to replace the injured Ricardo Rocha, which caused confusion in the center of defense which was compounded by Nelsinho’s sending off. 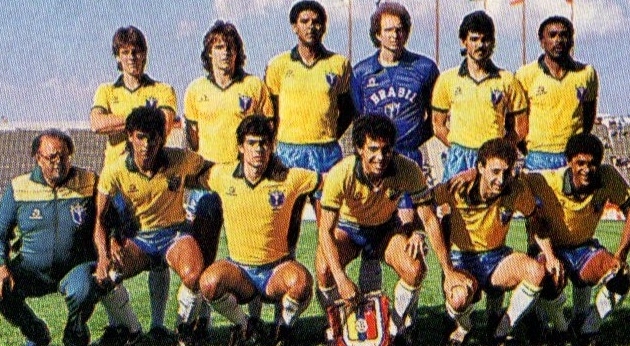 Former Star Zico blamed the Brazil Federation for organizing too many matches and tournaments during the season, which affected the players’ preparations. 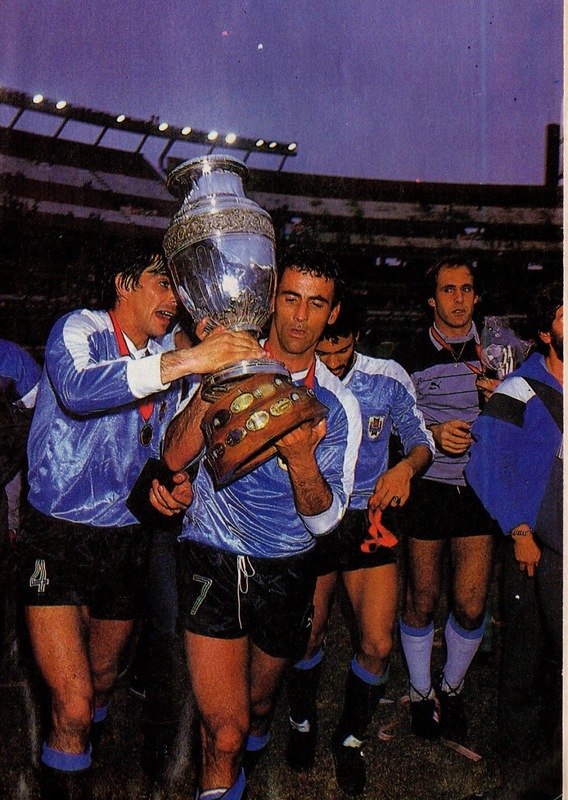 Even Argentina Manager Carlos Bilardo had his say. According to him, Brazil’s problem was in lining up Josimar as a defender. He felt Josimar would be more useful as a midfielder. 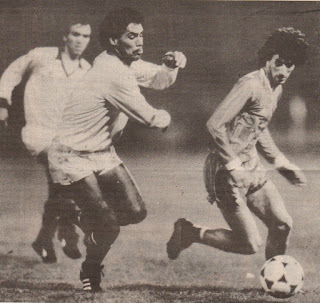 The Manager Carlos Alberto Silva still maintained confidence on his players and declared if he had to do it all over, he would select the same players. Despite being favorites to get the sack, C.A. 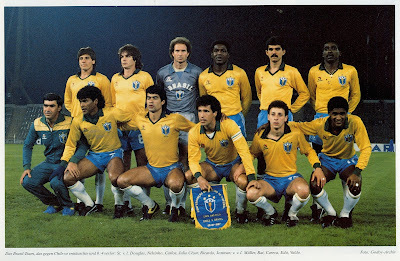 Silva actually remained in charge and guided the Brazil Olympic squad to the Final of the Seoul 1988 Olympics (1-2 loss to USSR) before departing. The new Copa America format was to take place every two years and the 1989 edition would be held in Brazil. The Organization and the Format of that Tournament would be revised in the hopes of a more successful Tournament. **Note: One source shows Antonio Revuelta (Club Blooming- Santa Cruz de la Sierra) as one of Bolivia’s Unused substitutes, however, he does not appear on any Finals list for Bolivia. Is there a list of the top players of tournament voted by the press?